I was actually surprised by how much I enjoyed this particular soup. I didn’t doubt that it would end up being delicious, but after pureeing and tasting it, I was shocked by how good it was, right off the bat. I was expecting to add some additional seasoning, or spices to amp it up, but it was already great. I added some more pepper and that was it. Soup complete! 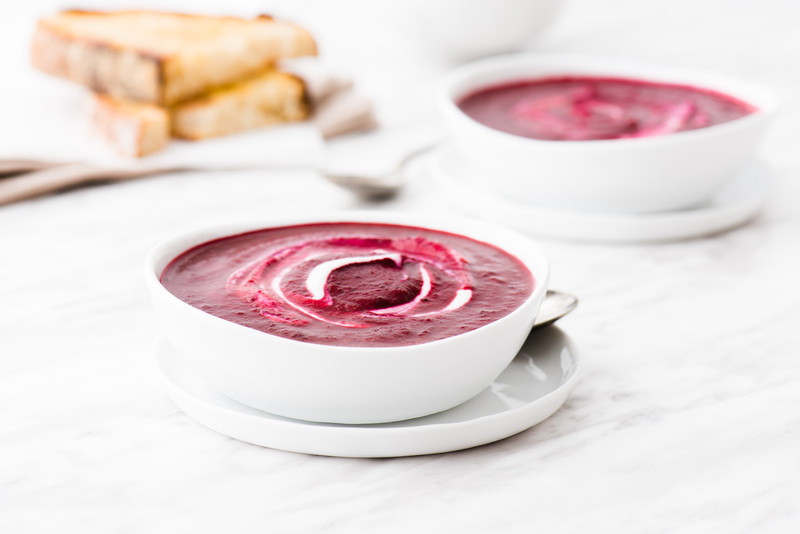 Along with the fantastic colour, the beets provided a nice earthy sweetness, while the zucchini gave the soup some extra body. 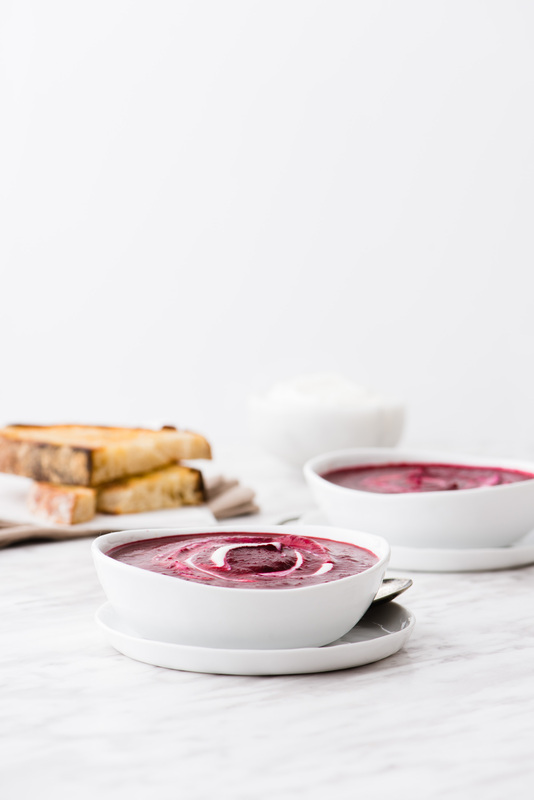 Served with a generous dollop of sour cream, it was totally satisfying, and I had more than a few bowls… Eating the photo soup doesn’t count anyways, right? 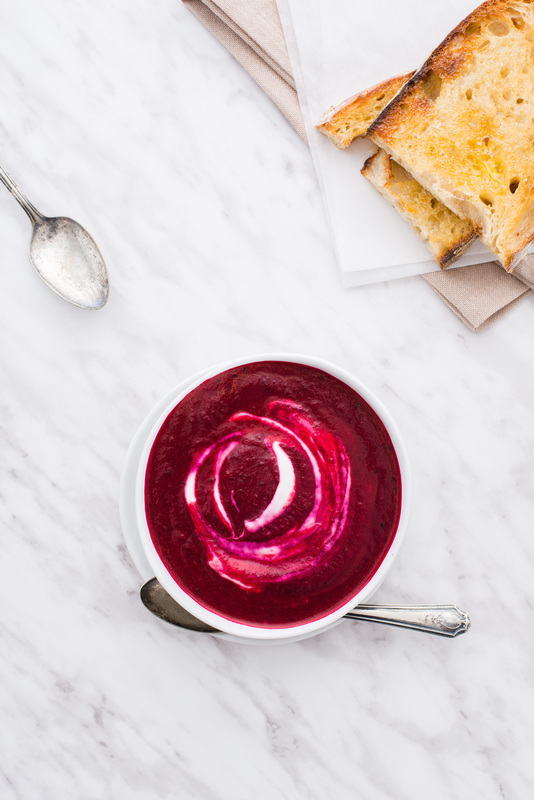 Beets provide a beautiful colour and earthy sweetness to this super easy soup. In a large stockpot on medium heat, add 2 tablespoons of olive oil. Once heated, add beets along with a few pinches of coarse salt. Cover pot with lid, and cook 10-15 minutes, stirring occasionally. Add onion and carrots, cooking for another 5-8 minutes with the lid on. If needed, add another tablespoon of olive oil. Add zucchini and cook 10 more minutes with lid on. Add chicken broth, bring to a boil, then reduce to a simmer, and cook, covered about 10-15 minutes, until beets and carrots are tender. Puree soup, and add salt & pepper to taste. Serve with a generous spoonful of sour cream. I recommend buttering up a few slices of fresh bread, dolloping a (more than) generous amount of sour cream, and digging in. Hi there! So… I made this last Sunday for dinner… with some changes (couldn’t use carrot due to dietary restrictions, so I used pumpkin, and I also added leek just because 😛 ). 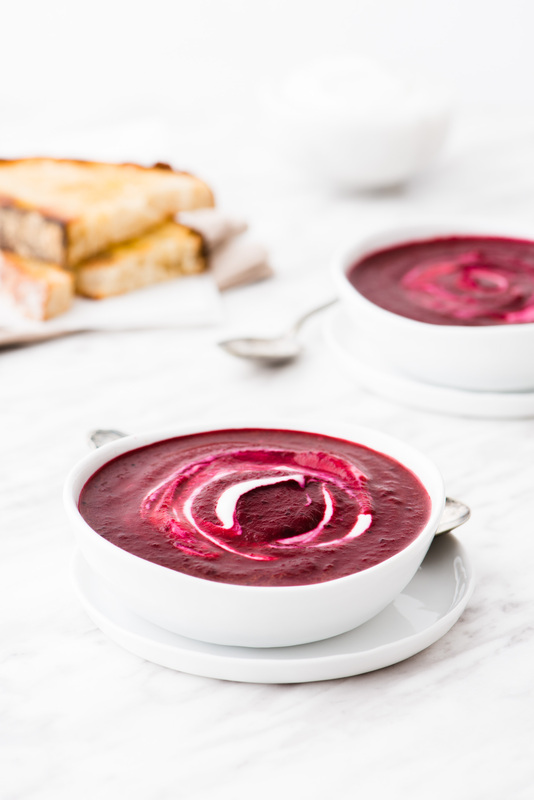 My boyfriend couldn’t stop laughing at the color… and he was kind of prejudiced about the taste when I mentioned “beets”… but SOMEHOW there’s no leftover as per today… fuchsia soup = major success! Thanks for taking the time to leave a comment Joana! Leeks and pumpkin sound like a great addition, and grated parmesan is always a good idea :). Greetings right back at you, all the way from (a currently snowy) Saskatoon, Saskatchewan, Canada! I was wondering if you served this soup cold or hot? I ask that because, in some ways, it reminds me of borscht. It’s served hot, but i’m sure you could serve it cold if you’d like! Just tried this with vegetable broth. Fabulous recipe!